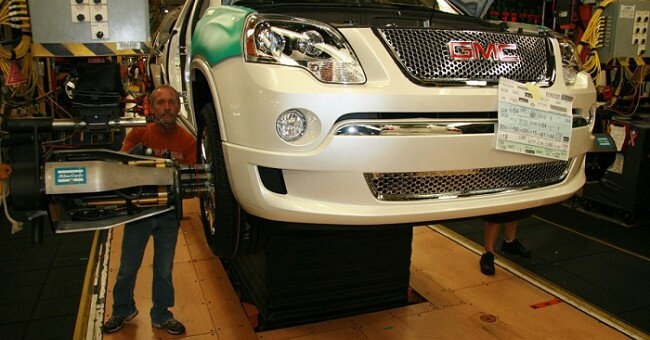 General Motors has plans to add a 210,000 square-foot extension to its Lansing Delta Township assembly plant, which currently builds the Buick Enclave, Chevrolet Traverse and GMC Acadia crossovers. The Detroit Free Press reports the $37 million expansion will add on to the facility’s body shop and general assembly sections. A larger body shop and assembly area will allow the company to add or retool assembly lines, which could be a sign a new model is heading for production at the Delta plant. GM hasn’t confirmed what its plans are for the Delta plant, with a spokesperson only saying they are “developing a business case for a potential future investment” to increase production, according to the Free Press. The automaker also wouldn’t comment on if more jobs would be made at the plant with the expansion. Currently, over 3,000 hourly workers on three separate shifts work at the facility around the clock. Construction has not yet started on the expansion, which will span nearly 5 acres and add 181,000 square feet to the body shop and another 28,000 square-feet to the assembly area. President of the Delta plant’s United Auto Workers Local 602, Bill Reed, told the Free Press the expansion is a strong sign that GM has continued interest in the Lansing plant. “It’s really a testament to say that our plant will continue to be upgraded and utilized,” he said. Earlier this year, GM requested a tax incentive from the city of Lansing to cut its property taxes in half for the next 12 years. It previously announced it will build a huge $44.5 million, 400,000 square-foot logistics center at its Lansing Grand River plant and will invest another $174 million to build a new 225,000 square-foot stamping plant there.